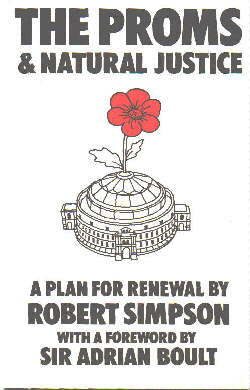 This little book was published 19 years ago, a year after Dr Simpson relinquished his position on the BBC's Music staff. In this important and provocative book Robert Simpson, for nearly thirty years a BBC Music Producer scrutinised the methods by which the Proms were planned. This late in the day, it is to a major extent taken over by events. Nevertheless, Simpson's thesis is still relevant, despite the enormous changes that have taken place within that (still) angst-ridden bureaucratic organisation. At the time, the BBC allowed the Controller, Music the absolute right to decide Prom programmes until death or retirement. 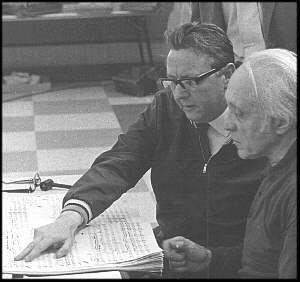 Since it was largely a management appointment, with succession virtually based on seniority rather than by musical qualification, the succession of the imaginative William Glock by a non-musician clearly rankled and brought Simpson's arguments to a head. Always ready to express robust opinions, but usually based on careful reasoning and his long experience inside the BBC, he argued that whoever the Controller might be, the effects of his individuality are bound to colour the programmes over time. He highlights in a convincing manner, the omission of many important composers. He felt the only logical way to give the Proms the flair that a single imagination can provide without the otherwise inevitable long-term imbalances affecting both composers and performers would be to appoint a separate planner of the Proms with a limited tenure of four or five years. Dr Simpson further examines the artistic gains and financial savings to be made from more extensive use of the BBC's own orchestras. Not only would this produce a saving of a staggering 62 % on costs at that time, it would give the planner almost total control over the repertoire. This would enable the Proms to become more adventurous than ever before and a true realisation of Sir Henry Wood's original vision. I don't think much has altered within the BBC.